Kristine, our Joimove Instructor from Glasgow South, has shared with us her thoughts on bringing Joimove to Doune the Rabbit Hole Music Festival, last week. I hope this summer has been good to you 🙂 and offered you all you wished for! For me, summer is all about blue skies, warming sunshine, enjoying lots of fresh air outside and of course time with my family. But one thing I also love about summer is that it’s Festival season. Every year, I try to go to at least one festival and this year was no exception. More than just being outside listening to amazing music, I love festivals because they’re a place where I can dance. Never before I have been in festival in UK because thought about changing weather and never ending mud bath has always put me off. Here in Scotland you need to be ready for all seasons in one day – that is what they say when talking about weather. But, Doune the Rabbit Hole Music Festival in Stirlingshire, Scotland really got me motivated to try one out. It seemed like a cool fest to check out, not only because of the many bands, stalls and activities, but because I saw it as the perfect place to spread the joy of dancing. It’s a very family-oriented festival, -and they host Joimove last year as Dance with Babies and Toddlers-, so it just seemed like the best place to share the beauty of dancing together, and introducing everyone to Joimove. With it being right at my doorstep, I thought “hey, I can bring my gear and it would be totally fun!” So I contacted the organisers and received a great welcome for the Joimove Family Dance workshop in their festival programme. I wasn’t sure what to expect from having a workshop at the Doune the Rabbit Hole, but you know what, it was great fun! Although my class was on the third day of the festival (so people were probably sleep-deprived), there was plenty of energy. Although many parents weren’t quite as fresh as the kids (who had TONS of energy), there were plenty of happy smiling faces from both adults and kids. We danced salsa, rock’n’roll, ballet and all the usual styles you’d get at a typical Joimove class. It really was just like being in a regular wonderful Joimove class, only in a tent at a music festival. Never been to a festival before? I can totally recommend it! It’s the perfect place to share the moment with your family and get a boogie on. Take the plunge, pack some wellies, your waterproofs, sunscreen, a few T-shirts, your dancing spirit and go! And your kids will love it to! Wherever you go, be a Joimover – dance and have fun together! “Joimove makes it to Taiwan! We’re so excited to share with you that Joimove classes are now being held at the Oovi Family Activities Centre in Taipei. The newly opened holistic parenting centre is a great place for parents to access classes, experts in baby-related fields and an excellent place for parents to build communities of friends. Along with Joimove classes, led by Diana Chendana, Certified Joimove Instructor and owner of the Oovi Centre, parents can access pregnancy exercise classes, baby and toddler swim classes as well as baby and toddler yoga classes. Diana Chendana says “I believe that through the classes we offer, parents are more energized. Oovi is a place where you can forget about other people’s expectations and just enjoy your baby, watching them learn and grow as they take in their world. It’s a safe place where you can just enjoy time with your baby”. JOIMOVERS of Glasgow performed a Babywearing Family Dance Routine in Dance House Glasgow Community Stage at the Merchany City Festival 2016, MCF 2016. This was Joimovers’ 3rd year at the Merchant City Festival where they shared their spirit of family dancing! Glasgow Joimovers met with their babies, moms, grandmoms, friends at the Briggait, got ready their props and quickly practised the routine for the first time together. And right after they were off to the stage to have a great fun. Joimovers are non-rehearsal performers who are mostly non-dancers. They turn up at the day enjoy being dancing together and share their love of dancing with everyone. Istanbul Joimovers Babywearing Dance LIVE Show. Joimove Turkey’s Instructors and Moms danced with their babies. Zahide Yetis’le 2 August 2016 Show TV. Not all baby carriers are created equal. It’s not that narrow based carriers are not safe; they all undergo rigorous testing before you buy them. It’s not even that many of them aren’t ergonomic for baby and wearer (though this should indeed be a factor when choosing a carrier or sling). Rather, the issue is more about what you’re planning on doing while wearing your baby. Walking around town? No problem. As long as it is suitable for your baby’s age and size and ergonomically fitted well most carriers and slings are suitable for this type of activity. Going hill walking? Better think twice about wearing baby in a pouch. Think of the carrier like shoes, you wouldn’t wear heels to climb a mountain so why would you wear a baby in a pouch if you’re dancing? Having a sling or carrier for all the different activities you could possibly undertake with your precious bundle really isn’t a manageable or realistic solution. More than just getting expensive, it can also mean having a rather large collection. So what can you do? You can adapt. Adapting a sling or narrow based carrier isn’t ideal for all occasions and shouldn’t be seen as a substitute for buying an ergonomic and well fitting carrier for extended use. 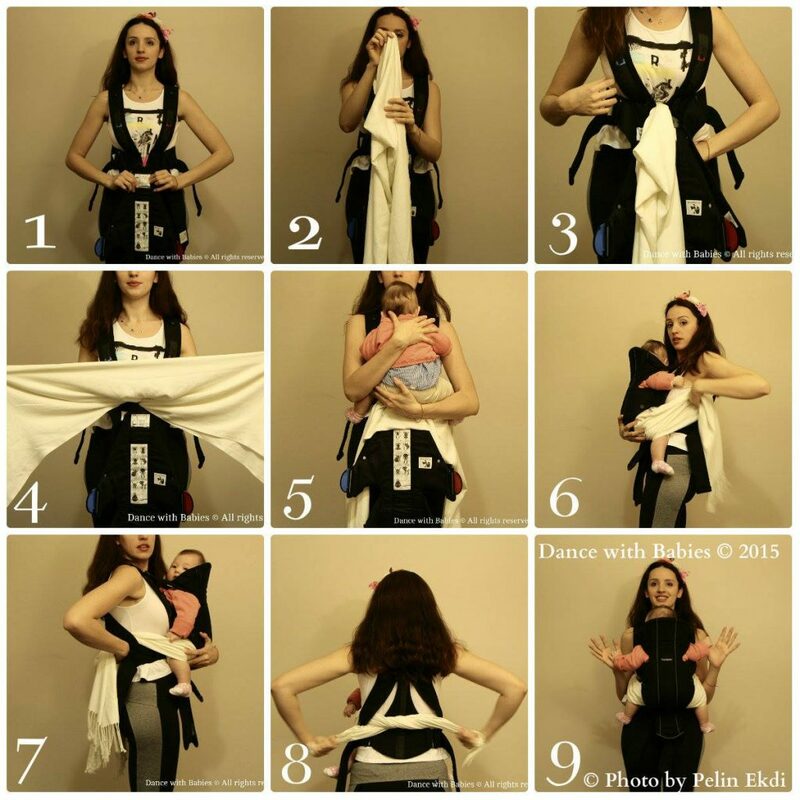 But, if you’re in a pinch, adapting your existing sling or carrier will help ensure you and baby are well supported to undertake active babywearing activities, like dancing. 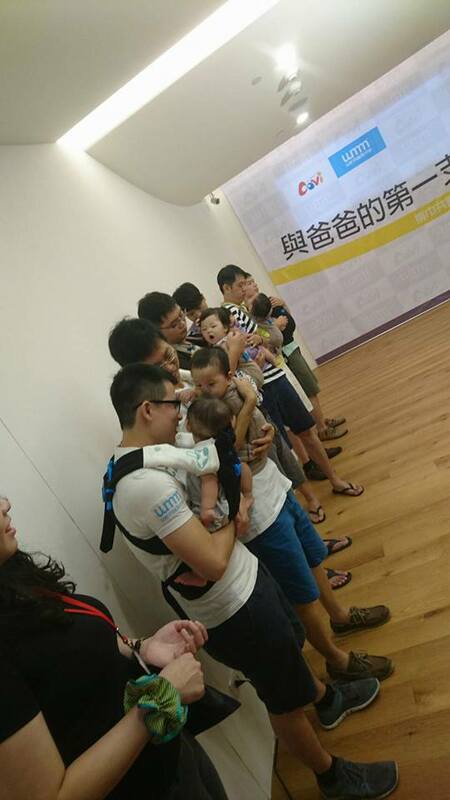 Remember, it’s always best use an ergonomic baby carrier or sling. It offers the best support for baby’s hips, legs and joints, and sits in a comfortable position to protect not only baby’s head and neck and spine but also the wearers back, shoulders and core. NOTE that- If carrier has a gap on the head part keep one hand to support your baby’s head and neck at most times during dancing!